Antec's Skeleton is a sight to behold, and you will, inevitably spend an evening just staring at it. It looks like something you'd be expected to shoot at had you managed to tolerate enough of Crysis. Add to this the 250mm multi-colour-lit fan topping it off, and you've got a truly mighty, er… case'. It's bigger than we expected, and it obviously won't ﬁt into your standard Ikea desk. You really want it mounted on a futuristic podium anyway, surrounded by laser-ﬁring robot lizards. Thanks to the exo-skeletal nature of the case, you can see all your computer's innards happily chugging away within, and if you've invested in decent kit and want to show it off this chassis is ideal - although there's no way to protect your memory sticks from prying hands. 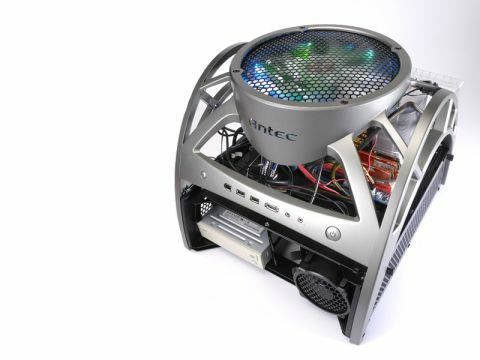 Antec does promise an inner guard in the coming months, however. Installing your kit in the Skeleton is fairly ﬁddly, and you can forget all you've learned from ﬁlling standard, rectangular cases. It has some smart ideas, though – the motherboard and PSU both sit on their own removable trays, and installing hard disks and optical drives requires a single screw in each. And, although it may look slightly rickety, the central body of the case is remarkably solid, especially when it's ﬁlled up with all the components. Air ﬂow through the case is as you'd expect – the large fan pushes air downwards and blows it over your motherboard and components and keeps them cooler than a canister of liquid nitrogen on Pluto (well, almost), while remaining whisper-quiet. A secondary, optional 92mm fan can be added in front of your hard disk drives to keep them chilly too, if they're feeling left out. You merely have to look at the Skeleton to decide if it's for you. It is stunning, but it's not the most practical of cases – anyone with kids or pets may want to steer clear lest they ﬁnd their pride and joy pureed. But, if you want something that makes your PC stand out, this is the case for you. Just make sure that no one sits on it.